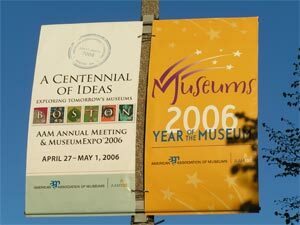 2006 marks the 100 th anniversary of AAM, and this year's AAM annual meeting in Boston, Massachusetts was a grand celebration. The members and Board of IMTAL contributed several sessions to the Centennial of Ideas and conducted the semi-annual IMTAL Board Meeting. The IMTAL Board met on April 26. Thanks to the hard work of Treasurer George Buss, a budget for fiscal year 2006-2007 was approved. The decision was made to post Board meeting minutes and the organization's tax forms on the web site (coming soon - look in the members only area.) Strategies were discussed to identify potential new members and to involve members on action-oriented committees. Plans were developed for the regional conference, the many IMTAL-sponsored sessions at the AATE conference, and the international conference in Ireland in 2007. Discussions were also begun about long-range planning, future elections, and IMTAL's relationship with members in Europe and Australia. IMTAL conducted public speaking workshops on two mornings for AAM attendees. Paul Taylor and George Buss instructed a total of 120 participants about posture, voice, power point, and other elements of successful presentations at the conference as well as with museum visitors. Twenty old and new friends gathered for the IMTAL luncheon on April 28. The group split in two to discuss the basics of museum theater as well as ideas, challenges, and advocacy for existing programs. We were very happy to welcome a group of museum professionals from around Mexico that attended the conference, including our luncheon, as part of a trip organized by the US Embassy in Mexico City. Simone Mortan from the Monterey Bay Aquarium and Tessa Bridal from the Indianapolis Children's Museum presented a session titled Tap the Heart or the Funny Bone for Social Change on the afternoon of April 28. Despite the afternoon time slot, attendance and interest were both high. Rashida Walker from the Indianapolis Children’s Museum portrayed a slave resting in Indiana home of Levi Coffin on her way to Canada and Simone Mortan demonstrated the Real Cost Café with volunteers from the audience. Due to the small size of the Expo hall, IMTAL was unable to present the Museum Theater Showcase, but brought in actors from around the northeast to roam the Expo Hall and talk with attendees. Thank you to all of the participating actors for representing IMTAL! IMTAL members at the conference received "Got IMTAL?" buttons to proudly wear around the conference. This was a successful way to raise awareness of our organization, with many conversations started by the buttons. If you are attending a conference in the near future, contact the IMTAL membership officer to get your IMTAL button and wear it proudly! Plans are already underway for next year's annual meeting in Chicago, IL. In the meantime, join us at AATE in Washington, DC this July or at the regional conference in Harrisburg, PA in August, or let us know how we can help you spread the word about IMTAL at any conference you might be attending. Feel free to contact any member of the board for more information.